Chalk City Road Maker and Stencils! We’ll start first with the Road Maker, it is a simple concept but with a little imagination (and maybe a tricycle) you can make all kinds of neat ‘roads’ and paths to follow! Stop, Turn Left, Turn Right (The turn sign is reversible) and go straight. These stencils are large (11″ across) and are very durable so they can put up with the wear and tear of children’s outdoor play. Kids can now ride their bikes, trikes, skateboards, and more in pathways they create! If you prefer a bit more of an obstacle course then there is the Obstacle Stencil Set as well! As large and as durable as the Road Sign Stencils, but these are designed for kids on foot following a track. Stencils have the kids hop (on left, right or both feet) do ten jumping jacks, or spin around five times (left or right). Chalk City and Spectrum Scientifics provide the tools, kids provide the imagination to make all kinds of fun obstacle courses. Meanwhile, to see these in action enjoy this video! So, are you the type who likes to make stuff with your hands? Have you ever done Origami? If you have or you haven’t you can still have fun putting together some paper models of NASA Space Probes! You can download any fifteen paper model pdf’s, print them out and fold them into space probes like the Mars Express shown on the right or probes the Cassini, Galileo, NEAR and others. There is even a balloon powered nanorover (you have to provide the balloon – they are not downloadable yet). The skill level varies from the simple to the challenging. So start out with a simple Cassini model and work your way up to the challenging Galileo probe! Enjoy! The Happy Drinking Bird – What happened to you? toys. It has been around for decades, it has appeared in The Simpsons (twice!). Its familiar ‘bob-and-drink’ action is memorable to all who see it and at Spectrum it is one of the most requested toys! But lately, something with the Drinking Bird supply has gotten a bit odd. First of all, let’s talk about how the Drinking Bird works. The idea is simple thermodynamics and the fact that gas shrinks when cooled. When the spongy head of the Bird is wetted and that water evaporates it cools the gas inside the bird’s glass body. That gas contracts when it cools and the liquid insides (a very thin liquid) gets drawn up to fill in the space vacated by the contracting gas. Very soon there is more liquid in the head of the bird that in its base and that causes it to tip over. If you put a glass of water where the bird tips it seems to almost be drinking – and in fact it is re-wetting its head! As long as there is water in its drinking cup it will keep on drinking. Not all drinking birds work perfectly out of the box. There will almost always need to be some ‘tweaking’ of the bird to get the guy to drink properly. The sides can get hung up, the body can be too high or too low in the frame, the frame can be bent the wrong way. This video shows a couple of the things that can go wrong with the Drinking Bird. 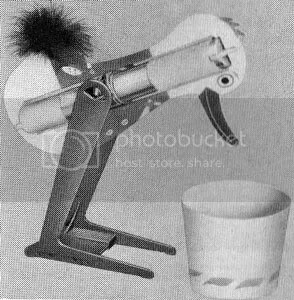 In the past, the Drinking Bird was a bit different. The liquid was more effective (and more dangerous!) and the designs much more varied (as this picture shows). Other designs were made to hang off the sides of the cup it was ‘drinking’ from. In the end the design we know today has been around for a long time with only a few variations out there. But what has happened to the Happy Drinking Bird of late? When we first started Spectrum Scientifics there were no less than six vendors that we could purchase drinking birds from. They all had different boxes, sure, but the basic model was the same. If you personally wanted a large number of birds and didn’t want to set up a store you could buy them in bulk on eBay for barely a fraction above wholesale cost! The options were plentiful! Now? Well let’s just say something has gone wrong – perhaps a overloading of the marketplace? All we know is that eBay has only about 40-50 entries for Drinking Birds listed – most of them single birds and often priced higher than retail cost (before shipping). Just a couple of years ago they had hundreds! You can still buy packs of the birds, but they don’t give you anywhere near as much of a discount as in the past. Two of the four vendors we use that dropped the Drinking Bird dropped them at the beginning of the year (if you are wondering why four vendors instead of six: two went away) and only one of them gave any reason (saying the in warehouse breakage of the glass birds was too much). The remaining two have respectively a) raised their price way up and b) did not have them in stock this year until the beginning of this month! So what is going on? It is hard to say. Perhaps it is a thinning out of some kind of fad supply, much like the recent shaped rubber bands that went into fashion with kids and out again in a period of 3 months. Perhaps more likely is that the main manufacturer changed their rules so that there would be fewer distributors around, or just made it to hard for vendors to get refunded for damaged product. We may never know for certain but one thing is for sure: We still have them, but there aren’t as many as there were before. There’s nothing more to say than to say it: The last Space Shuttle flight will take place on July 8th, 2011. After that it will be some time before American’s are in space via NASA rocketry. The Space Shuttle program first started in the aftermath of the end of the Apollo missions. Part of the concern was the fact that most of the Apollo missions went up on huge rockets and only tiny modules would return. Since the Moon was no longer an objective the Shuttle was designed as a workhorse rocket that would have reusable parts (boosters, the Shuttle itself). After some tests (such as the famous non-operational glider decoupling and landing of the Shuttle Enterprise) the Shuttle first flew in April 12 1981. It would continue for over 30 years. There were bumps in the road, the Challenger Disaster in 1986 on take-off and the Columbia burn-up in reentry in 2003 were major setbacks that resulted in major delays. The biggest problem was that the shuttle was never the ‘Space Truck’ NASA hoped it would be. Initial plans hoped for dozens on flights each year, instead of an average of just over flights per year. But still, it got things done.The fleet is also a bit long in the tooth, and the (accurate) joke about the Shuttle’s computer is that the most powerful computers on board are the laptops the astronauts bring with them. The joke started in the early 90’s to put that in perspective. Right now NASA is still trying to figure out what will replace the Shuttle program. The previous program was canceled after major delays and cost-overruns turned it into a boondoggle. Time will tell what comes next. How Warm is my Dinosaur? Just a bit of fun news: for the first time scientists have been able to measure the temperature of dinosaurs. In the past people considered dinosaurs to be just big lizards and thus cold blooded. In recent decades, evidence showed that dinosaurs were actually the ancestors of birds and probably not cold-blooded. Now they have been able to run some tests that are the next best thing to having a time machine and a thermometer. Turns out the dinos were not as warm as birds, but much warmer than modern lizards! One of the more intriguing products we carry in the store are the Hand Boilers. The concept is actually kind of tricky, but first let’s see one in action! The Hand Boiler (sometimes called a ‘Love Tester’ or other awkward names) is actually a bit of a deceptive name: There is no boiling taking place. If there was the expansion from liquid to gas would shatter the glass quickly, sending shards all over. Not a great toy. the heat from your hand expands the air inside the Handboiler. When it expands the air pushes the liquid up the glass tubes and into the top reservoir. As it gets warmer the expanding air cannot all fit in the bottom reservoir so some of it ‘escapes’ up through the liquid to the upper reservoir, causing the liquid to seem to ‘boil’ when in fact the liquid is simply bubbling the way a soda would when you blow into it with a straw! The Handboiler can actually be a little tricky for some folks: if you have cold hands it might not work as fast as other folks. If you look at our video you may notice that he use both hands to make the HandBoiler ‘boil’ since he had poor circulation. (he still got it to work though) . What fools some folks into thinking that the liquid is actually boiling is that the liquid is actually not water but a much thinner colored liquid (its an alcohol). But while such liquids may evaporate quickly when they touch your skin they are unlikely to boil in such quantities in the Handboiler. The Handboiler is a nifty gift and a fun fidget toy, but it is even more fun when you know what is going on! 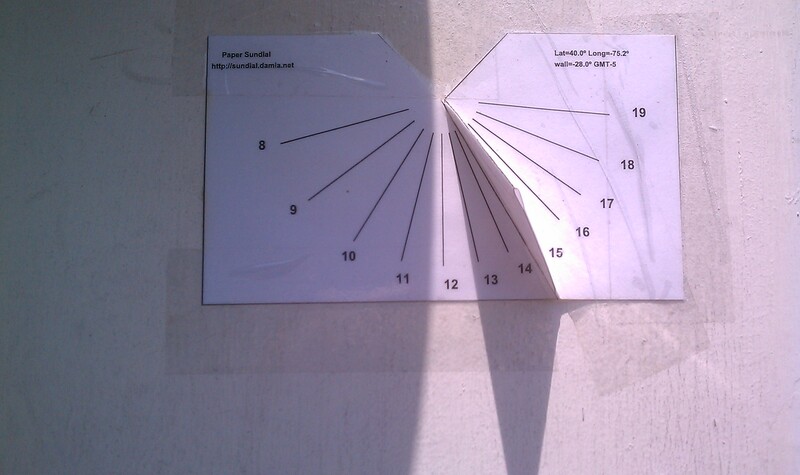 Paper Vertical Sundials, now where where we…. …oh right! We were telling folks how to get a paper sundial printed out. Well we got ours all printed out and happy. We cut it out and folded it up. …and realized it would not last through the first drizzle. This would be a problem as summer rains happen almost daily at this point. So what to do? Well, in our case we printed out another sundial and put it through the lamination machine! Now it was covered in plastic and protect from the elements, at least for a while. If you don’t have a lamination machine (most people don’t) then clear packing tape can help protect your sundial. Its up to you if it is easier to apply the tape before or after you cut it out. We certainly had to put the paper through the laminator before cutting it out (jammed lamination machines tend to burn). OK. so the big shadow you see is from the canopy of the store next to ours. During much of the day it completely covers the sundial’s shadow. But for a few hours the thing does a nice job of giving you the time. Take note that it does show time in a 24 hour clock pattern. Hopefully you will have better luck than we did and have a non-shadowed space.